The above picture shows how we lay porcelain paving to millimetre perfection on this patio, using spacers with this slab work to ensure every line and angle is perfect. Pergola built with lighting, two different types of porcelain, using the silver moon and driftwood to give it some contrast. 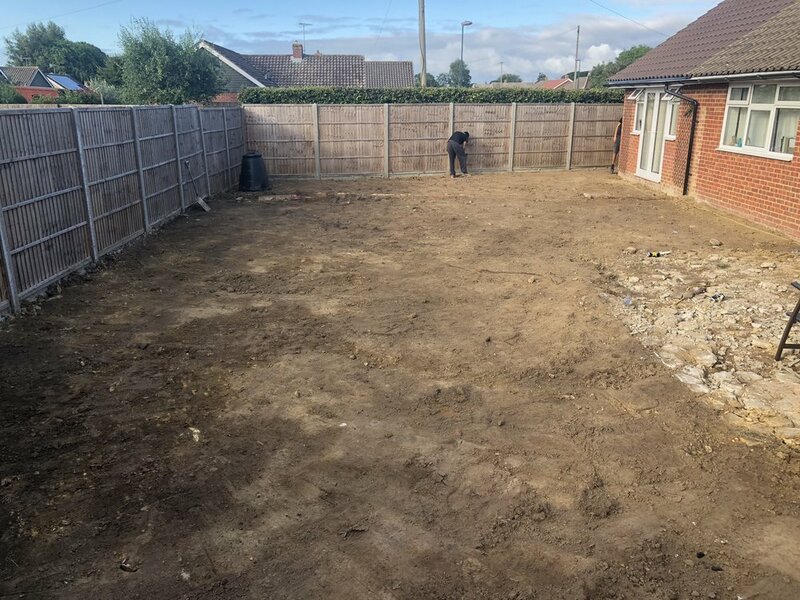 Here we completely transformed this garden, from an overgrown mess to a simple maintenance free garden, we replaced all the fencing with closed board panels and concrete posts, created our levels with the Alpha Antique block then laid the Canterbury slab in old Cotswald, to finish we used Grono artificial grass. This Patio surrounding the pond we used the stunning porcelain in driftwood and a silver Alpha edging, the patio was laid near Arundle, we also installed lighting into the edging block which brings it all to life at night. 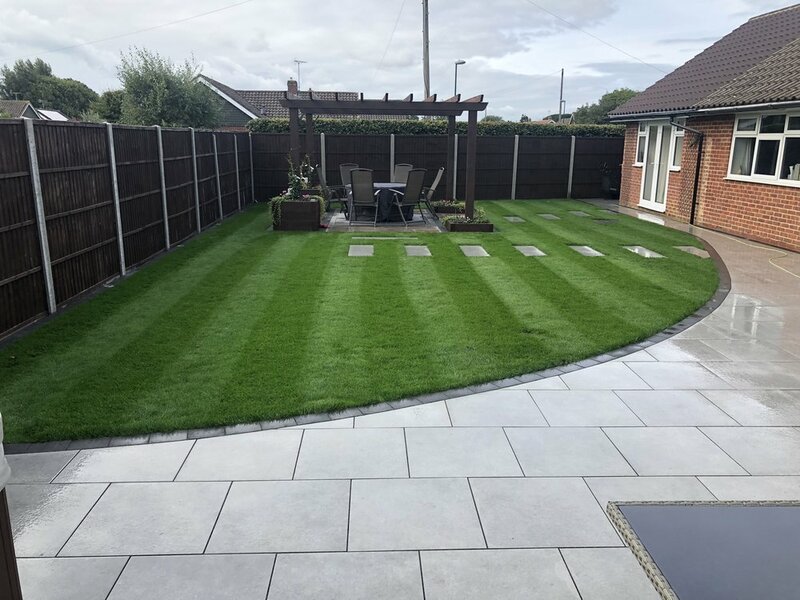 The beautiful Indian sandstone in fossil mint with a brindle Alpha block edging creating a stunning patio, we also installed a centre circle with a block edging to make it stand out. With the colours truly complimenting the surrounding area, this really is a patio that stands out. 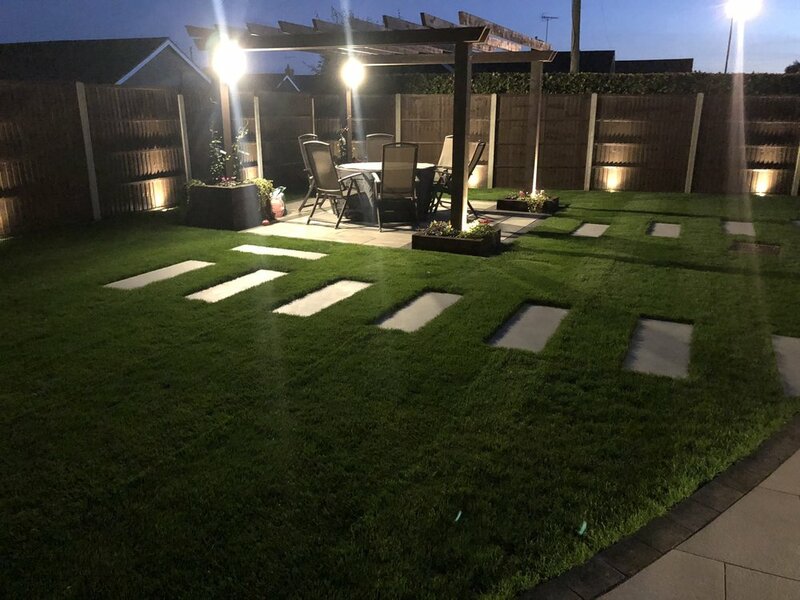 In this stunning Patio area we used the global stone porcelain and within the steps we have installed lighting creating a very ambient area at night. 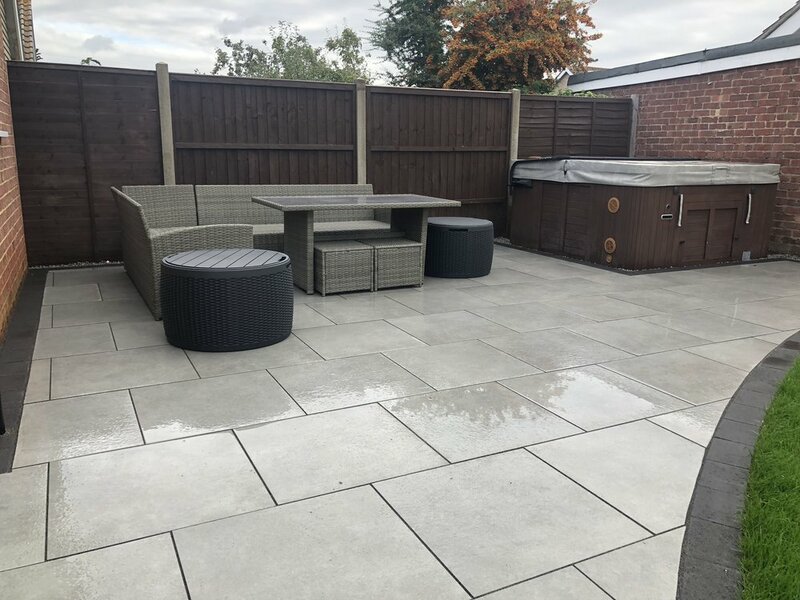 A Patio that really has some style, installed in Chichester and creating a stunning space to relax and over look the garden. On this lovely house we used Granite paving to create the patio, all the surrounding areas were re-leveled and freshly turfed. Using polished sandstone we laid this patio in the most spectacular of locations in Liss in hampshire. Another complete garden makeover, all ground was removed and taken down to the required level, we used the Brett Lugano block for the edging, the paving is Brett porcelain in Vintage oak, blue ice chipping which have a slight hint of grey and Grono artificial grass, making this a maintenance free garden that has a very impressive finish. This was a fantastic garden makeover to do, from a garden with levels all over the place we completely gutted it out, replaced all the fencing around it with closed board panels and concrete posts, we used a mixture of paving, firstly the Brett Bronte paving in weatherd buff, around the fire pit we used old York stone and on the upper level we used rippled limestone. 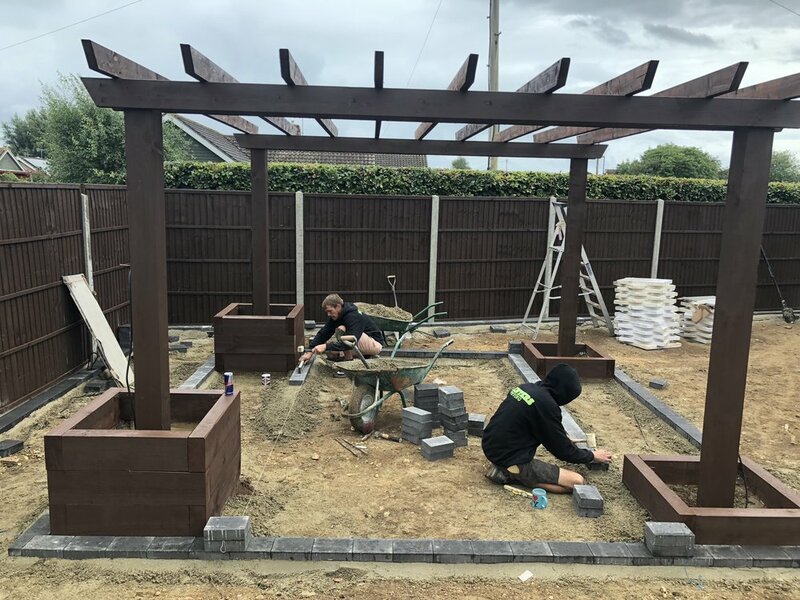 The cabins were pr ordered and we put them together, installed electric sockets into the cabins as well as lights all around the garden to make it usable on darker evenings. There is also an area where we used Grono artificial grass which is the children's play area. We completely transformed this garden which we designed and followed the specifications to the smallest detail. Here we have re-surfaced the pond and the patio surrounding it, we used Indian sandstone in fossil mint with brindle block edging. 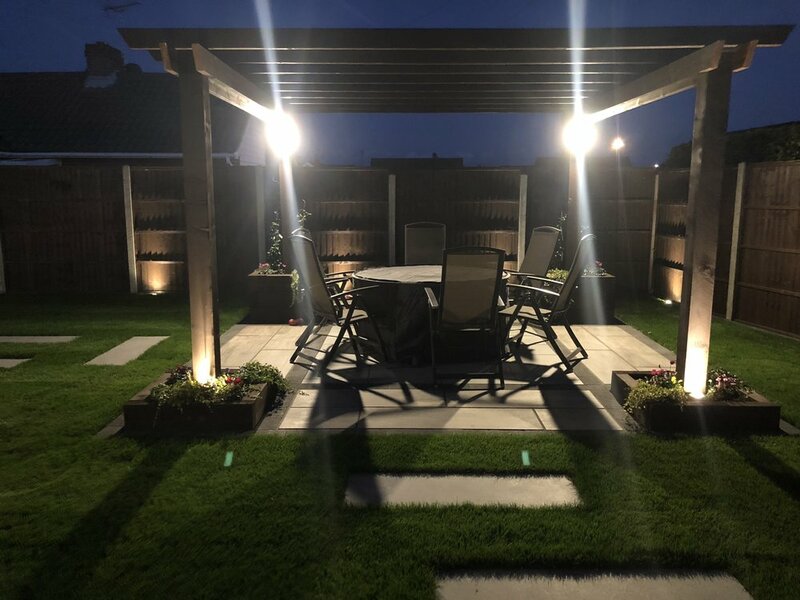 We Have used Indian sandstone in Buff Multi with a charcoal edging to create this patio, we also installed some lighting along the edge to bring this patio to life at night. 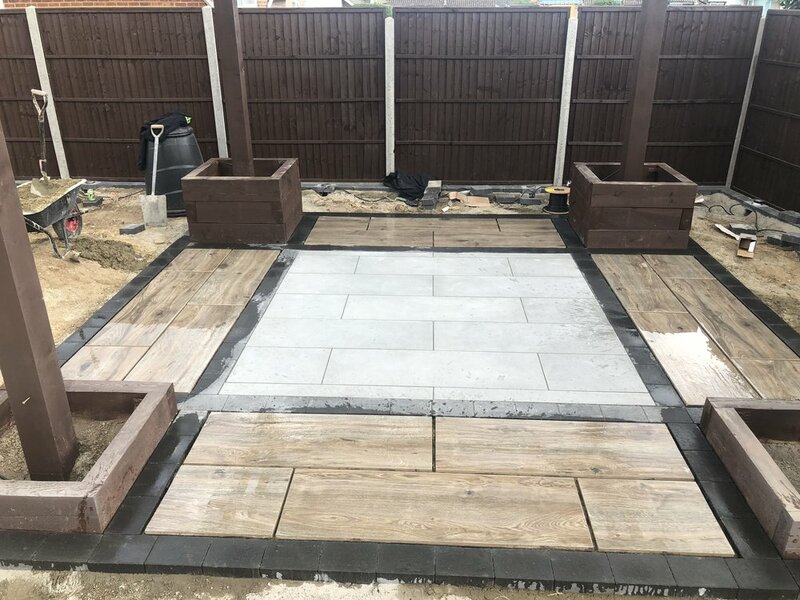 Brett Porcelain paving in driftwood, as you can see in the picture a drain recess cover has been installed with the porcelain paving cut to fit with millimetre perfection.